Installation of underground electrical and communications utilities began this week. With Whidbey Island local Krieg Construction providing trenching support, BME installed the first of thousands of feet of conduit on this project. The P-8A flight simulator is the first step in the platform change from the P-3 to the P-8A at NAS Whidbey. Over the past months BME has worked closely with The Korte Company, Sparling Engineering, Boeing, and Navy Facilities Engineering to develop the design for this fast-track project. Now the real work begins! 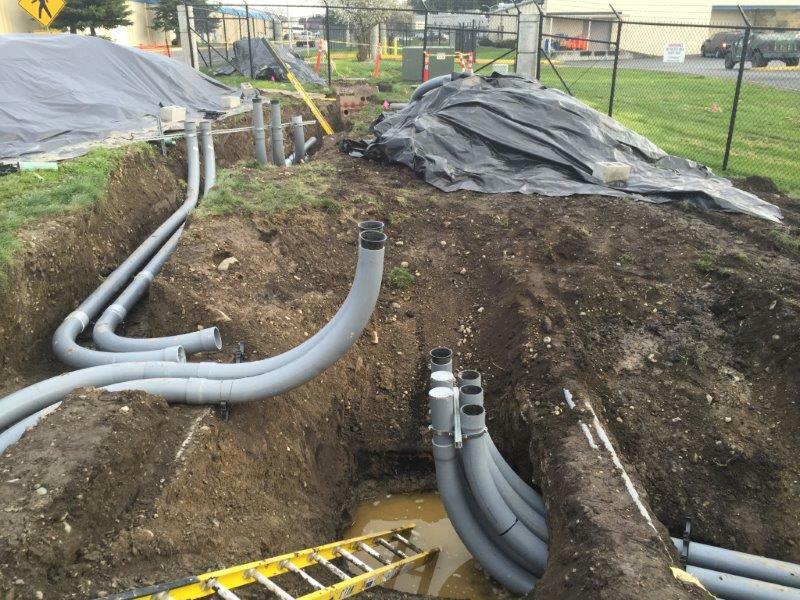 Five inch PVC conduit is installed underground. Upon completion it will contain 12,470 volt conductors to serve two transformers powering the simulator building.